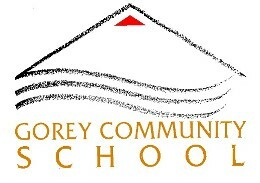 Gorey Community School was established in 1993, following the amalgamation of the Loreto, Vocational and CBS schools. It now has a student population of almost 1500 and a teaching staff of more than 100. The school occupies a large site which comprises playing fields, basketball courts, and tennis courts. In 2000 a new extension was opened. There are now over 80 classrooms including numerous specialist rooms and a large gymnasium. Our logo, designed by Fergal Keane a pupil of Gorey CBS, depicts the amalgamation of the 3 schools in the triangle. The curving lines represent change, while the red triangle at the apex symbolises the striving for excellence.